It’s no 4×4, but it’ll do. California has more than its fair share of things to claim for itself. The state is proud of these things. Some (like skateboarding) for no apparent reason, but others are good reason to give California bragging rights. One of these things is In-N-Out Burger, the fast food that never fails to please. 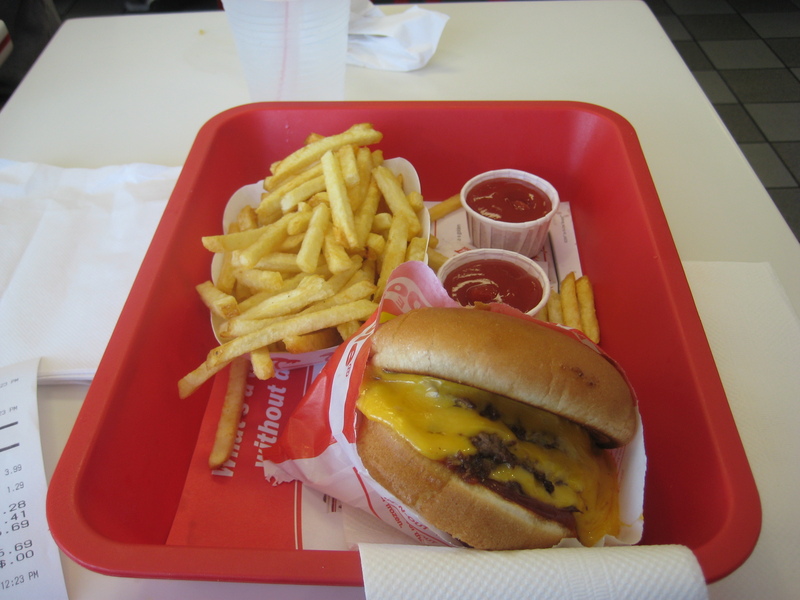 In-N-Out breaks the rules of the traditional fast food restaurants. Even people who say they don’t eat fast food go to In-N-Out. Their menu is so basic that they need a secret menu to make people happy. The drive-thru lines protrude so far beyond the land that has been zoned to them that they have people walk outside to take orders. So it’s a pretty unique place, but what about the food? For my usual order at In-N-Out, I delve into the realm of the Secret Menu, which has my favorite burger, the 4×4. The 4×4 has four patties, four slices of cheese and the rest of the regular fillings. On this day, however, I was only feeling like a 3×3, which, as you can imagine, has three of each of the aforementioned ingredients. The burgers usually come with with a special sauce that I’m pretty sure involves some sort of vegetative ingredients, so I get mine with ketchup instead. I also make sure to get it without onions or any other unfortunate vegetable they are currently trying to pass as a topping. As a side, I ordered myself some well-done fries. Typically the fries at In-N-Out disappoint, but if they are fried just a little bit longer, it makes a world of difference. Now, the meal I had was quite good, but to be honest, it’s not the Jesus of burgers that the whole state of California makes it out to be. A lot of people say it is their favorite burger, and I just don’t know how they say that. To be sure, it is great for a fast food burger, but it cannot stack up to the competition of real burgers like Fat Burger.